A select development of 11 new homes in the tranquil surrounds of this East Ridings hamlet. Four homes are currently open for reservations at Woldgate Pastures. More information on Plots 2 - 7 will be released later in 2019. Standing proudly on a corner position with a large extended kitchen-dining area and separate study, the Howsham offers an impressive layout for the whole family to enjoy. Upstairs are four double bedrooms, two with en suite shower rooms. Externally, gardens are brick walled to the rear with lawns laid throughout, with a York stone patio completing the landscaping. The Howsham also enjoys an attached double garage with private parking for two cars. The Sledmere is a distinctive detached family home with four double bedrooms, a large open kitchen-dining area and double aspect living room leading on to the rear garden via French doors. Externally, the gardens are brick walled to the rear with lawns laid throughout. A York stone patio completes the landscaping. The Sledmere has an attached double garage with private parking for two cars. 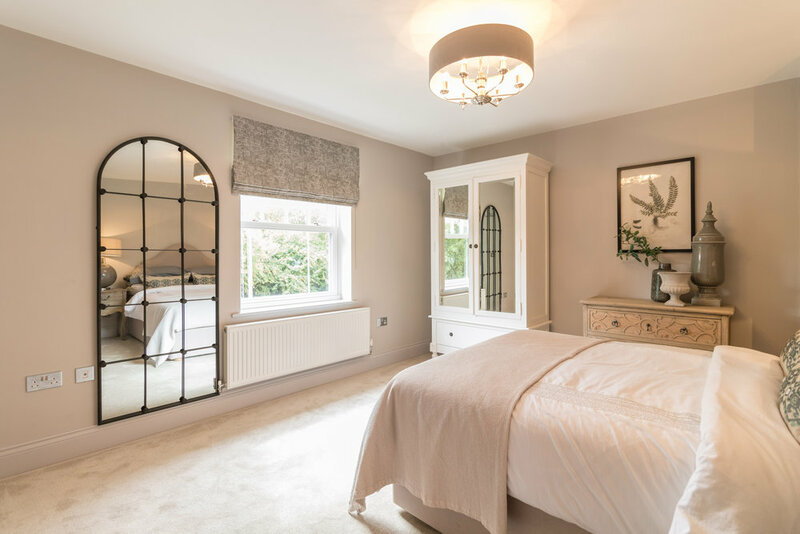 Handsomely presented throughout, the Dalton offers four double bedrooms with an ensuite to the master. On the ground floor, a spacious open plan kitchen-dining room is complemented by the addition of a study. Externally, the striking front facing elevation is finished in an off-white render with contrasting brick details and a bespoke front door portico. An attached garage and private drive parking are included. Matching its twin in almost every respect, the second of the two Dalton-type homes at Woldgate Pastures again offers four double bedrooms alongside an open-plan ground floor layout. This home is currently reserved. A distinctive detached family home with four double bedrooms, the Sledmere offers a large open kitchen-dining area and double aspect living room leading on to the rear garden via French doors. 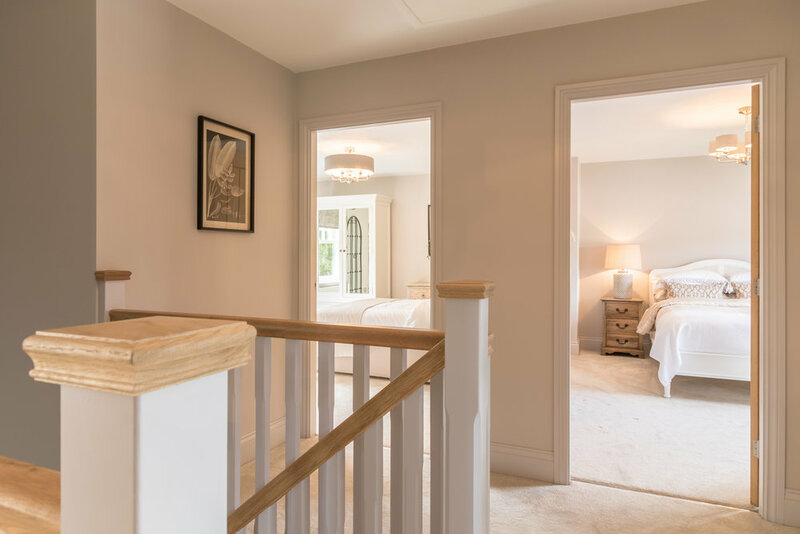 As with all Palladian homes, the properties at Woldgate Pastures will be finished to an exacting specification that includes tiled or wood-floor entrance hallways, Farrow & Ball painted skirting and architraves, wood burning stoves and inglenook style fireplaces. 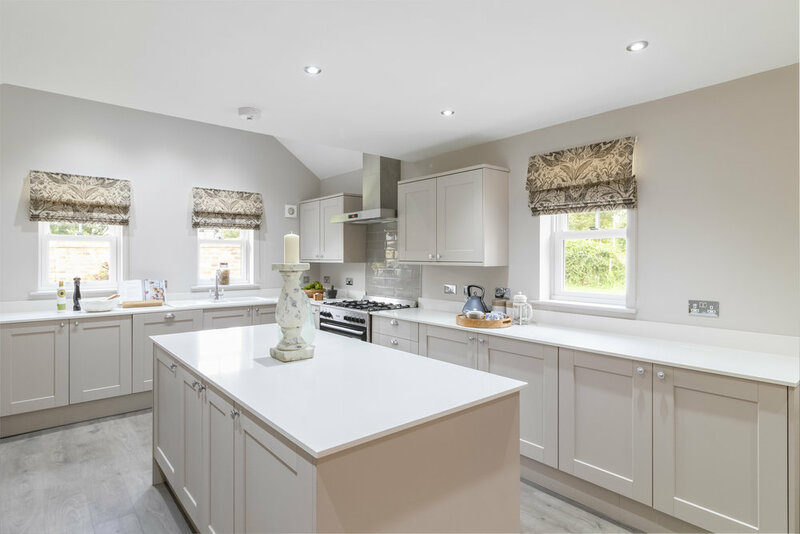 Sympathetically designed to compliment its peaceful village surroundings, Woldgate Pastures is a stunning development of 11 three, four and five-bedroom new homes in the small and picturesque hamlet of Kilham. Around five miles from the market town of Driffield, with Beverley and its many attractions just a 30 minute drive away, Kilham boasts a highly rated Church of England primary school, a Grade 1 listed parish church that dates back to Norman times, and a range of amenities that include a post office, butchers, village shop and pubs offering traditional ales and a welcoming environment. A perfect location for those seeking a tranquil home environment alongside a genuine sense of community, Woldgate Pastures combines the very best of rural living with easy access to the rest of the county. With a history as rich and varied as the surrounding countryside, the picturesque village of Kilham is one of East Ridings’ most charming hidden gems. Located on the eastern edge of the Yorkshire Wolds – a series of low, sweeping hills that run west towards the Vale of York – Kilham combines beautiful rural views with quick access to the East Yorkshire coast and its many attractions. Bridlington sits less than 10 miles away, while Filey and Hornsea can both be reached by car in under 45 minutes. The village itself dates back more than a thousand years and is referenced in the Domesday Book, at which point two ‘thanes’ (landowners granted their territory by the king or a nobleman) held most of the area. The land around Kilham has passed through the hands of many owners over the years, notably Thomas Ughtred – descended from an old Saxon family – and William de Thwenge, son of Sir Marmaduke Thwenge, who fought in the Wars of Scottish Independence. For a long time, Kilham played a key role in the Wolds’ agricultural economy. A major market town, bigger at the time than neighbouring Driffield, Kilham hosted numerous trading fairs and served as a lynchpin in the growth and distribution of grain to London and the West Ridings. Wool, another vital commodity, was sold to mills in Leeds and Wakefield. As the years went by, and with the opening of the Driffield Navigation waterway in 1770, Kilham’s economic relevance began to dwindle. The population of the town slowly decreased, leading to its eventual reclassification as a village. Even today however, indications of Kilham’s agricultural past remain: an old stone tethering block by All Saints church serves as a year-round reminder of the village’s once booming cattle trade. Despite the relatively small size of the village, residents of Kilham are well served by a range of local businesses and facilities. A convenience store is just a short walk away from Woldgate Pastures, perfect for everyday needs, while a long-established family-run butchers can also be found around the corner. The village Post Office, located in the middle of East Street, provides everything from banking to bill payments. Villagers also enjoy two well-reviewed pubs – The Old Star and The Bay Horse – both of which serve food and offer a wide selection of real ales. A fish and chip shop offers an alternative for food on the run. Those looking for more recognisable high-street names will be well served in Driffield, less than 15 minutes away by car. Stores including Tesco, Lidl, Boyes, Boots and Currys can all be found in the nearby town, supported by a range of banks, bars, hotels and restaurants. The local primary school – Kilham Church of England – boasts a ‘Good’ rating from Ofsted, including an ‘Outstanding’ ranking for the behaviour and safety of pupils. Described as a ‘happy and caring school where pupils thrive and achieve well’, satisfaction amongst parents is notably high. Kilham is ideally situated for those looking to combine beautiful countryside living with quick access both to major towns and some of Yorkshire’s very best scenery. By car, Scarborough, Beverley and Malton – home to the popular annual Food Lovers Festival – can all be reached within around 45 minutes, with Hull and York a further 15 minutes away. To the east, Bridlington is just 30 minutes by road, with Flamborough Head and its many natural delights just a short drive further. Local attractions include Burton Agnes Hall, an Elizabethan stately home with a stunning walled garden, and Sewerby Hall, a grand Georgian house that includes a zoo and woodland walks. The Yorkshire Wolds Way, a 79-mile trail from Filey to Hessle, offers cycling and walking through some of the region’s most vibrant countryside and picturesque villages.